The Boss (I’m tired of capitalizing the whole thing each time) comes from NEwhere, a company that seems to specialize in disposable products with no nicotine. 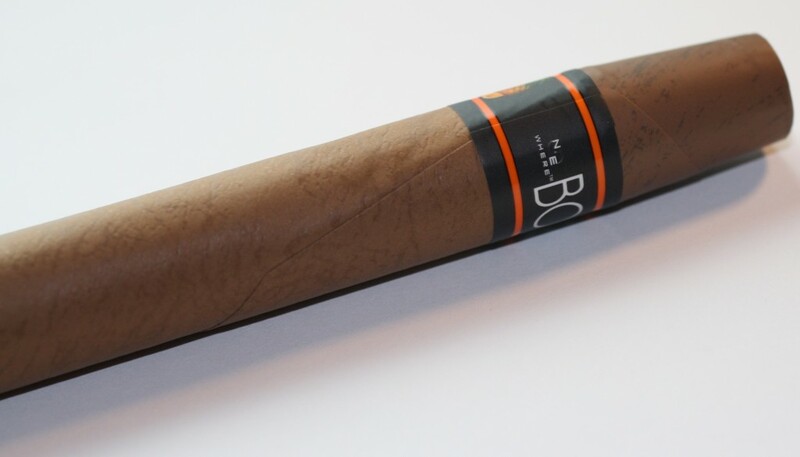 The $19.99 Boss is no exception, it’s a zero nic cigar. As I mentioned in the intro, there are two available flavors: orange pineapple and watermelon. Neither flavor is what I’d refer to as a traditional cigar flavor. I swear I taste a hint of that generic “tobacco” e-cigarette flavor underpinning the orange pineapple flavor I am sampling. I’d be lying if I didn’t say the whole thing is a little bit weird. Perhaps the reason why its so weird is the physical attributes of the electronic cigar. 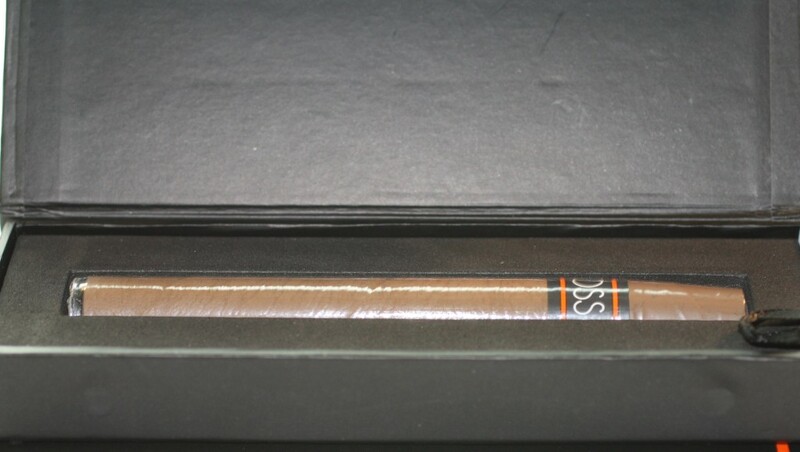 It’s an amazingly good facsimile of an actual tobacco cigar. 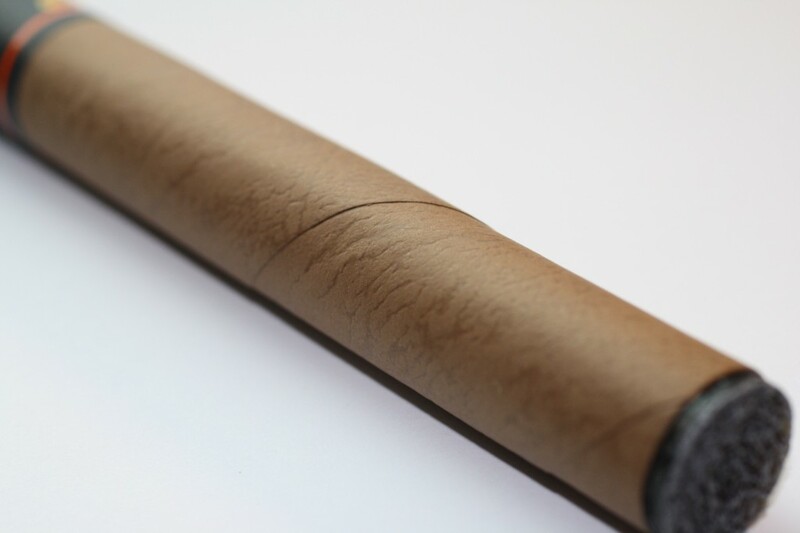 The exterior of the device has the feel of cigar paper. It’s perhaps a little smoother so it’s more like a machine-rolled stogie as opposed to the sort of rough feel of a hand rolled stick. The entire electronic cigar is also very soft with enough give that makes it an awful lot like holding a real cigar. I’ve made no secret that I’m a fan of e-cigars, and this one has at least the best physical sensation of the ones I’ve tried. There’s even what appears to be a cigar label, but I can’t peel it off, so it’s part of the skin somehow. The one variation from the traditional look is that it sports a blue rather than red or orange LED on the ash cap. I get a lot of satisfaction out of chomping on the end of this thing while I write this review of the Boss e-cigar. But then I take a puff. I think this might just be me, but the orange flavor just kills the illusion. This is especially weird as I generally prefer fruity flavors, and dislike most tobacco flavors a great deal. It’s just somewhere in my cigar chomping memory, this thing doesn’t compute and I don’t know what to think. The lack of nicotine also doesn’t help me get over the gap. While I use a fairly low nicotine level in my vaping, I still need a little something to give me that extra sensation and throat hit. Couple that with the odd flavor, and I have to say while this might be a decent enough product it’s just not for me. Perhaps you might think differently, head over to NEwhere’s website and pick one up for yourself if you’d like to try. PREVIOUS POST Previous post: Could tobacco bonds fuel political resistance to the e-cigarette?